"There are injustices in this world. Bad things happen to good people." Settling the west was no small task. Aside from the unknown of venturing into a new territory, all manner of danger in animals, weather and people (just to name a few) make the goings extremely tough. Black Jack Press has an anthology that delves more deeply into some of those more emotional terrors in Tall Tales from the Badlands Volume 3. "The Judgment of the People" is written by Mark Wheaton and illustrated by Jerry Decaire, "Apologies" is written by Sean Fahey and illustrated by John Fortune, "Rustlers" is written by Robert Napton and illustrated by Franco Cespedes, "All Mine" is written by Matt Dembicki and illustrated by Ezequiel Rosingana and "Where the Heart Is" is written by Fahey and illustrated by Ruben Rojas. Lettering in all stories is done by Kel Nuttall. In "Judgment of the People," a corrupt judge doles out justice rather ruthlessly, not realizing that eventually he himself will be judged. "In "Apologies," a family finds themselves stranded in the wilderness and faced with extremely difficult decisions for surviving. In "Rustlers," a train robbery goes really wrong when the robbers aren't entirely certain what the cargo is they're robbing. In "All Mine," a pair of gold diggers learn that they're not the only ones seeking the wealth. And in "Where the Heart Is," a family new to the frontier learn that living the old way isn't all it's cracked up to be. Each of the stories in Tall Tales from the Badlands Volume 3 plays on some base human emotion in an attempt to offer a surprising twist. These aren't tales of horror per se; rather, they're more tales of the weird in a wild west setting. "The Judgment of the People" features a title character whose ego is so large he thinks he's appropriate to pass sinister judgments on any and all who come before him, while the robbers in the "Rustlers" let their greed cloud their better judgment. "All Mine" flips the greed of others into their demise, while "Where the Heart Is" features a family who misses their former life. The twist at the end of "Apologies" is probably the most severe, as it turns hope into further fear. All stories boast that undercurrent of fear and are tied together by it, even if their use of fear isn't a direct attempt to scare the reader. The art in Tall Tales from the Badlands Volume 3 is pretty varied. Decaire's work in "The Judgment of the People" is very intricate, with detailed characters passing through minimal backgrounds. Fortune chooses something uses something of a cartoonish style in "Apologies," which somewhat undercuts the severity of the emotion within, but does add a certain level of fantasy to it and still looks good. "Rustlers" includes panels packed with characters and action, all of which Cespedes uses to make the story feel like it's moving very quickly. "All Mine" feels the most like a "traditional" comic book presentation, with Rosingana presenting neatly arranged panels conveying the action succinctly with attention to detail. Finally, "Where the Heart Is" gives Rojas the chance to offer feature-rich characters interacting with one another amidst the somewhat barren west. Tall Tales from the Badlands Volume 3 is an interesting anthology that presents the west in a way that's a little different than expected. Characters interact with one another in ways that speak to the depravities of human nature that we're capable of when we want to be. Each story in the anthology maintains this baseline of human decision-making as a means of conveying varying degrees of terror to the reader. The black and white art style maintains that atmosphere, setting a tone of uncertainty for both the characters and the reader. 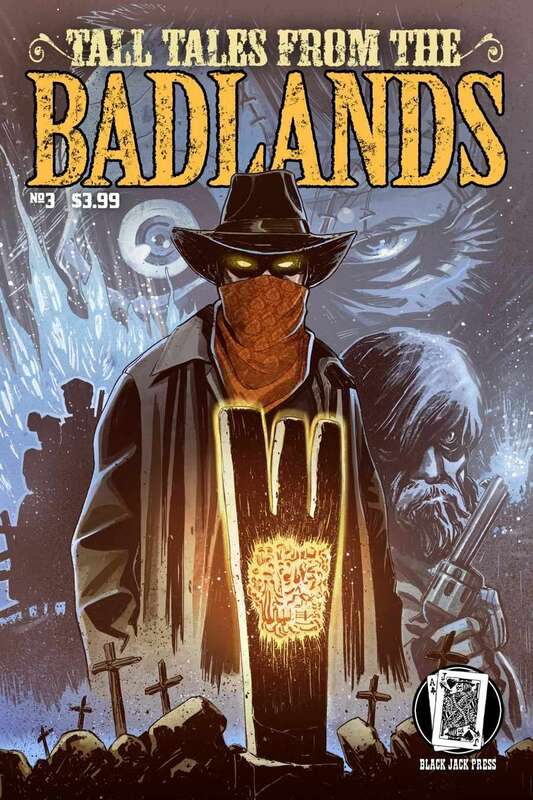 Tall Tales from the Badlands Volume 3 is definitely worth checking out if you're looking for something slightly off-kilter and set in the wild west. Tall Tales from the Badlands Volume 3 is available here.